One person is dead and at least four students are in the hospital after a school bus crashed on the way to Furr High School. HOUSTON -- One student was killed and three others seriously injured when a school bus crashed off the 610 South Loop at Telephone Road. 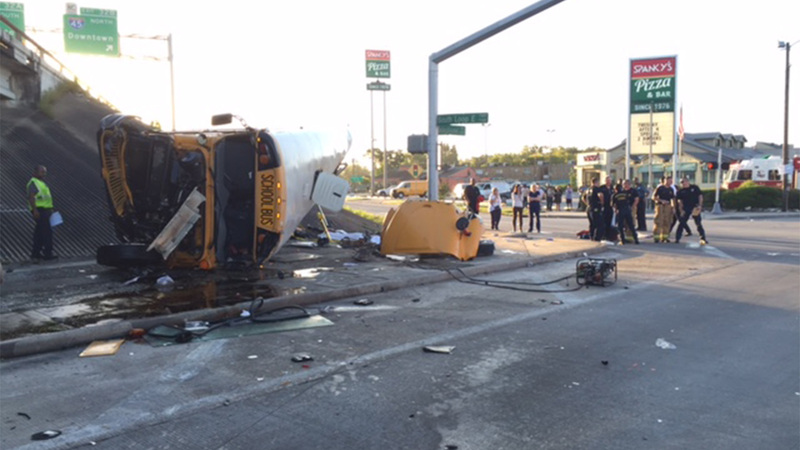 HISD officials say the bus was bound for Furr High School. There were four students on board, including a female who did not survive. The other three students were taken to the hospital as was the driver. There is no word on their conditions. "I was coming up Telephone Road on my way from work and I hadn't got quite to the red light and I seen the bus come off the freeway," said Anthony Martin. "The bus (came) off the freeway nose down at more than 50 miles an hour in nose down off the freeway, tore the front off it. It sounded like somebody just hit a brick wall."